There’s no such thing as too much heraldry. 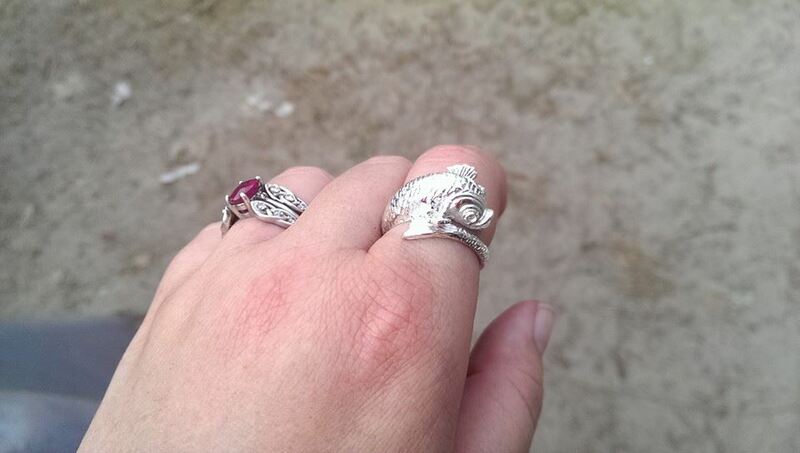 Dolphin ring from Gentry Jewelry at the Bay Area Renaissance Festival in Tampa, FL. 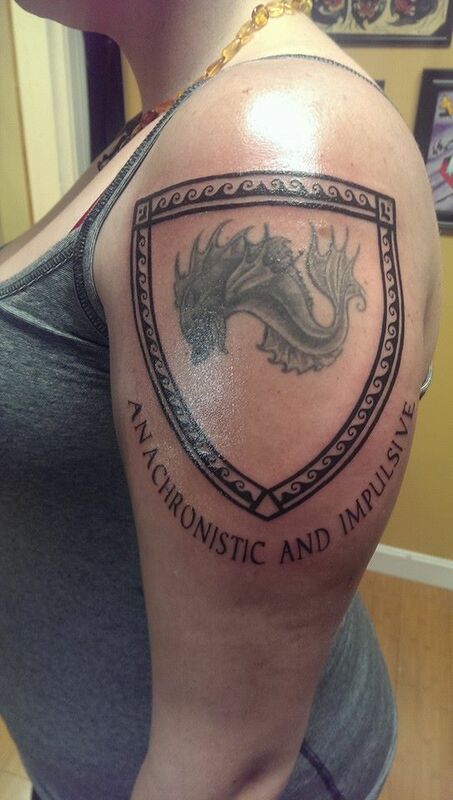 Dolphin tattoo by Ron Ricci in 2011, bordure with diapering (fancy heraldic speak for design) and motto done by James @ Grim North Tattoo in Portsmouth, NH. Will be colored in a month. King’s and Queen’s and Theses and Classes. I know it’s not like me to not post for a month, so here’s a little recap. Last weekend my Lord Geoffrey and I competed at King’s and Queen’s Arts and Sciences in Montreal, Quebec. It’s always a treat to visit Canada, as the Principality of Tir Mara here in the East always knows how to put on a good event. Plus, poutine and beer. If you haven’t eaten your way across Montreal, I recommend it. I mean, there’s way more than poutine and smoked meat, but you at least get poutine, and smoked meat, or both at the same time. Like I did. For those that don’t live anywhere near Canada, poutine is a comfort food that basically consists of French fries smothered in a specific type of brown gravy and fresh cheese curds. It’s any dieter’s nightmare, and that’s okay. It’s sort of a Quebecois staple, but I know it’s quite popular in Ontario and the Maritimes as well, and trickling down into the Northern US. No, it’s not Disco Fries, which is a Pittsburgh thing. 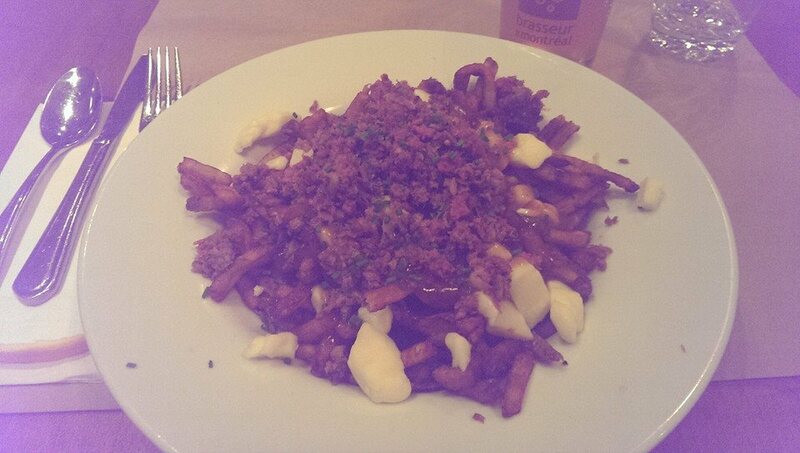 Poutine with Montreal smoked meat. Yes, this happened. Oh hey, this was our collective displays. As you can see, I wrote another icon, this time of Anne and Mary, so I’ll be adding pics of that in my next post. Other than that hullabaloo, my semester is focusing on the material culture of Early New England, so I haven’t really had too much time to stay in Byzantium as much as I wanted. I’m interning at a historic house here in my town, and planning to dig this summer at an American site, so my overall material culture focus has completely shifted right now to a period I don’t particular know a lot about, so as I’m focusing on that, a lot of my SCA stuff is getting pushed aside. As it should, because GPA before SCA. My thesis, however, has been preliminarily approved by my advisor, and will have to do with Byzantium, as it should, because I should play my strengths, not my weaknesses. Once I get that in full swing, I can discuss more about it, but do to the nature of academic research for a grade versus research for the betterment of a re-creation group, I can’t really share too many details just yet. But it will have me developing patterns and sewing through the summer and fall. I’m not giving up completely, though, I do have my CLASSES SCHEDULED for East Kingdom University and Pennsic War. At EKU, I will be giving my primary source class, as well as a class on how I broke down the Tunic Under the Stairs (another post coming, probably this week while I’m in Florida on spring break) to get my pattern that I use for my garb. 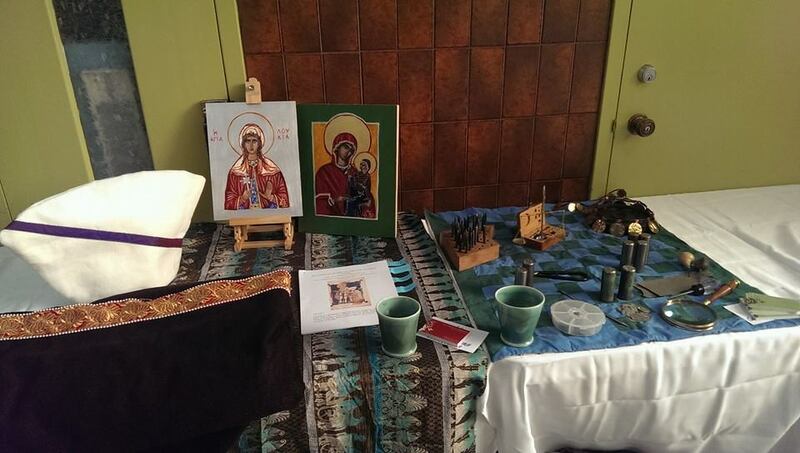 For Pennsic, I will be giving that tunic class again, as well as one on Persian influences in Byzantine Dress. I am only teaching those 2 classes at war this year, since 4 really takes a lot out of me, and neither of them are 2 hours long (my poor voice last war!) So this will leave me plenty of time to do other things. Especially if I don’t sprain my ankle this time. With that said, I’m on my way to Florida. I need to see some [effective] sun after this crappy winter we’ve had in New England.